When IRONMAN Legacy athlete Jennifer El-Sherif’s alarm goes off at 4:15 a.m., she has more than 100 reasons to get out of bed. 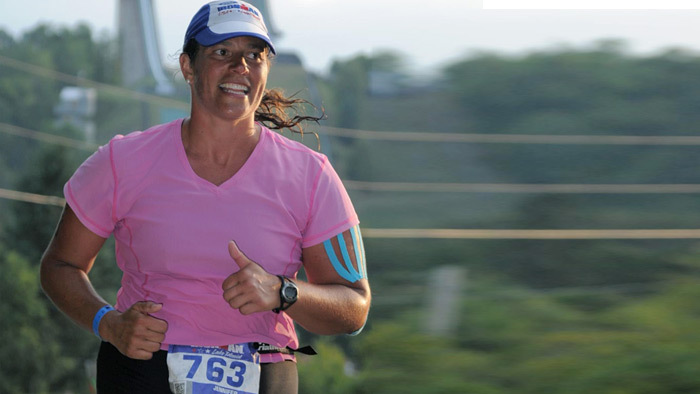 That’s because the Salem, Massachusetts, resident is motivated not only by her own goals—and as a 16-time IRONMAN finisher, she has plenty—she is driven to be an example to the students she teaches at Salem State University. El-Sherif has quite the mouthful of a title: She’s an Assistant Professor of Physical Education Teacher Education in the Sport and Movement Sciences department. She teaches a full, 12-credit class load and balances a 25-hour a week training regime—a volume on the level of some professional triathletes. It isn’t easy, but she’s on a personal mission to show her pupils that sport and health provide long-term enjoyment. Inspiring her students has been a longstanding personal mission for El-Sherif, who taught K-12 Physical Education for 12 years. She says she’s been disheartened by inactive and overweight coaches in her field, and aims to be the opposite of that. “I try to be the example that you don’t have to be ultra-thin to be healthy,” she says. El-Sherif swam since she was a child, and rowed through high school and college. She got into cycling and running as a way to continue to compete and have fun. “I swam several days a week before work or while at work, and through trial and error learned how to ride a 14-speed bike. I built my endurance to ride 24 miles,” she recalls of those early days. She spent college summers working at Red Wing Park in the town of East Fishkill, New York, and was inspired to try a shorter distance triathlon held there. Multiple sprint, Olympic and long-distance races followed, and then, IRONMAN Florida in 2001. Before she had even crossed the finish line however, she’d registered for IRONMAN Lake Placid 2002, thanks to a friend’s convincing. “There was such a feeling of accomplishment,” she says of her first finish. “My initial goal had been 15 hours and to finish in under 13 was more than I expected.” El-Sherif has since raced IRONMAN Lake Placid nine times, IRONMAN Florida and IRONMAN Wisconsin twice, as well as IRONMAN races in Louisville, Arizona, and Mont-Tremblant. Her cumulative total is 16 finishes. Throughout her training, she is often a visible role model to students, sometimes squeezing runs in as warm-ups while coaching varsity soccer, rowing and field hockey students. She has been known to fit in workouts before school or in between classes—whenever she has a free moment. Which is exactly what she plans to do when she races as a Legacy Athlete at the IRONMAN World Championship on October 11th, where several of her friends and students will be waiting at the finish line. “Kona is the climax of IRONMAN,” she says. “I’m looking forward to the challenge, the variety of people who are out there, and to compete in what’s probably one of the most difficult endurance races out there. But most of all, she says she’s looking forward to showing her students that when you set goals, anything is possible. For more inspirational stories like this one, go to IRONMAN.com.